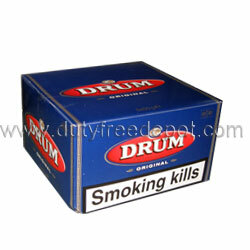 Drum is the number 1 brand for rolling tobacco in the world. This rolling tobacco is manufactured in two different locations in the world – the original is from the UK under Douwe Egberts corporation and the other in the US (specifically by Republic Tobacco in Illinois). Both have their own unique flavors and strengths. 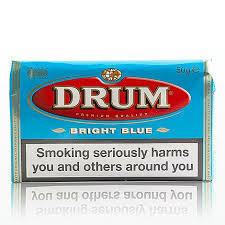 Rolling your own cigarettes is a proven way to cut down expenses on cigarettes which explains why Drum, with their low prices, is so extremely popular for the last 50 years and exists in most western countries in the world. Some people even like the act of rolling tobacco as a hobby and the famous fictional detective Sherlock Holmes often solved crimes while rolling and smoking tobacco. If want to cut down on expenses for cigarettes the combination of rolling tobacco and Duty Free Depot cheap prices is the way to go. All products ordered from Duty Free Depot always get worldwide shipping. No matter where you live in the world we will always ship to you! In addition our support and sale teams are professional and can guide you through the purchase process or answer any question and solve every problem you might have.